Requirements for Blackstone Valley Paddlers Events. Questions ? Contact Cheryl StoneFoxFarm@juno.com 401-497-5887. Complete BVPC Calendar In the event of a last minute cancellation or modification to a paddle trip, please check the Message Board. Note: Inflatable PFDs (life vests) are not acceptable for paddling on RICKA Flatwater trips or Blackstone Valley Paddle Club trips. 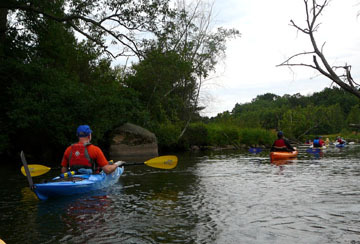 Blackstone Valley Trips prohibit inflatable kayaks. BVPC paddles resume May 14th 2019! May 14th Upper Pawtuxet River in Hope RI. SNEP paddlers are invited to this BVPC paddle. Cskurka@cox.net and 401-823-8925. Cheryl Thompson stonefoxfarm@juno.com 401-497-5887. For questions about the BVPC, Contact Cheryl StoneFoxFarm@juno.com 401-497-5887. Suitable for all boats and levels of experience. Hope Landing Access. Rt.116 to Hope Furnace Road, access to upper Pawtuxet River. 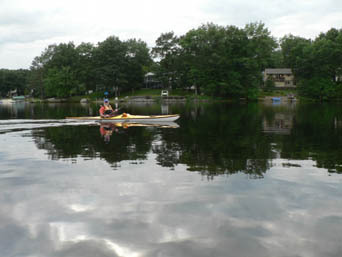 Paddle up to the Scituate Reservoir and back again. The water is very clean, coming directly from the reservoir. A 4 mile round trip. Coming from the North, travel on Route 116 South into the village of Hope, in the town of Scituate. Just past the junction of Rt. 115, look for the bridge crossing the river. Turn right onto Hope Furnace Road. The access to Hope landing is down a short gravel drive. If the trip is cancelled due to weather we will try to offer it on the next day (Wednesday). Check the message board for changes and cancellations to trips - flatwater message board. Please check the board before leaving for any trip. Our leaders provide directions as a courtesy to paddlers however, you are responsible to refer to a map and familiarize yourself with the trip location. May 21st West River Uxbridge Meet at 6:00, launching Promptly at 6:15 pm. Trip is suitable for boats 14 feet and under. You'll have the chance to see lots of wildlife as you paddle upstream through this stretch of clean, clear flatwater. 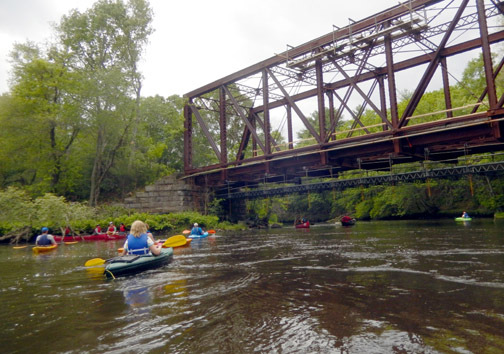 The West River, like the Nipmuc River has excellent water quality and is one of our rivers that is clean enough to swim in the Blackstone Valley. You definitely wouldn't mind falling into this section of the river! Also, no shuttling is necessary. 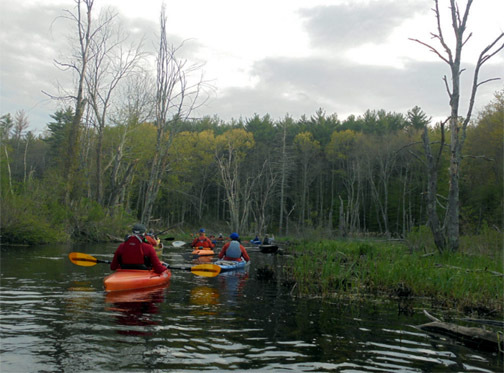 May 28th West River Upton MA Meet at 6:00, launching Promptly at 6:15 pm. For this section of West River parking area is on the left just before Town DPW Garage on 100 Pleasant Street in Upton, MA. (over Blackstone River) to end and take left onto Quaker Street. Follow about 2.5 miles (Quaker St. becomes Pleasant Street) and parking area will be on left just before traffic light and before DPW Garage on right. June 4th Nipmuc River. Meet at 6:00, launching promptly at 6:15 pm. This river, above the pond and above where the Clear River enters, is listed by the state as pristine water, the state's highest rating for water quality. 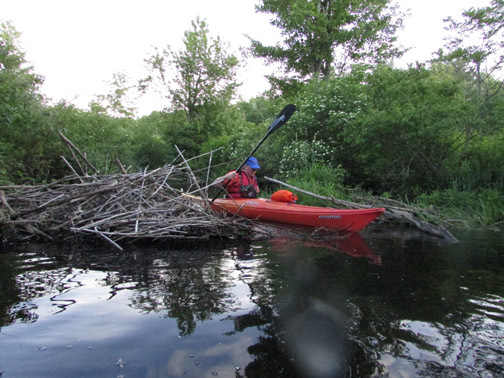 Note, if you choose the river route, there are numerous beaver dams to drag your boat over. Directions from the South: Quickie directions: 146 North to Route 102 West to East Ave to Harrisville to Route 98 and the Harrisville Fishing Area just outside of town by the green bridge. *More detail: Take Route 146 North (On 146 North, make sure you stay left when 146 and 146A split) to the Forestdale/Slatersville exit. At the top of the ramp turn right and then left at the light. This will turn into Route 102. Once you enter Burriville on Route 102, you will watch for East Avenue and a sign for Harrisville at a traffic light (it should be the second light at an intersection you come to.) Turn right and follow East Avenue all the way into Harrisville. When you enter the town you will drive over a bridge next to the dam. Turn right onto Route 98 at the next intersection. Just outside of town on Route 98, is a large green truss bridge. Park next to the bridge by the Harrisville Fishing Area Sign. Directions from the North: Quickie directions: 146 South to Chocolog Rd. Right on 146A by Darling Farm. Right on 98 south to green truss bridge by Harrisville fishing area. *More Detail: Take Route 146 South until you get to the Chocolog Rd. Exit. At the end of the ramp turn left onto Chocolog Rd. and head towards Route 146A and Uxbridge. By the Darling's Sewer service, turn right onto the Quaker Highway/Route 146A. Turn Right onto Route 98/Aldrich Street by the Little Texas Restaurant and the old Brick Quaker Meeting House. Drive about seven miles south on Route 98. During that seven miles, you will cross into Rhode Island. Watch for the large Sherman Farm because just after the farm is a large green truss bridge. We will be parking by the bridge. If you get to the Harrisville Fire Station, you have gone too far. June 11th Rivers Edge Boat Launch on the Blackstone River in Woonsocket. Meet at 6:00, launching Promptly at 6:15 pm. Trip is suitable for all. Take Rt. 146 south into Rhode Island. Continue on Rt. 146 past the exits for Forestdale/Slatersville (Rt. 5/102), Pound Hill Road, and Downtown Woonsocket (Rt.104). Approximately 2.5 miles after you pass the Downtown Woonsocket exit you will come to a stoplight – you need to be in the left lane. Take a left at the stoplight on to Sayles Hill Road (There will be a small sign on the left directing you to Rt. 99). Continue on Sayles Hill Road until you reach the intersection with Rt. 99. Take a left on to Rt. 99 north toward Woonsocket. At the light at the end of Rt. 99, take a left on to Rt. 122 - Mendon Rd. Continue on Rt. 122 through three stoplights - you will now be on Cumberland Hill Rd. Continue on Cumberland Hill Rd. about a mile until you reach a forth stoplight. At this light, take a left on to Hamlet Avenue - you will be on a bridge crossing the Blackstone River. Immediately after the bridge, take a quick left on to Davison Street. The entrance to the Rivers Edge Recreational Complex is about a tenth of a mile down the road on the left after the bike path parking lot. Turn into the Rivers Edge Recreational Complex and continue about a quarter of a mile until you see the sign for the Canoe Launch on the left. Take Rt. 146 North to Rt. 99 North. At the light at the end of Rt. 99, take a left on to Rt. 122 - Mendon Rd. Continue on Rt. 122 through three stoplights - you will now be on Cumberland Hill Rd. Continue on Cumberland Hill Rd. about a mile until you reach a forth stoplight. At this light, take a left on to Hamlet Avenue - you will be on a bridge crossing the Blackstone River. Immediately after the bridge, take a quick left on to Davison Street. The entrance to the Rivers Edge Recreational Complex is about a tenth of a mile down the road on the left after the bike path parking lot. Turn into the Rivers Edge Recreational Complex and continue about a quarter of a mile until you see the sign for the Canoe Launch on the left. 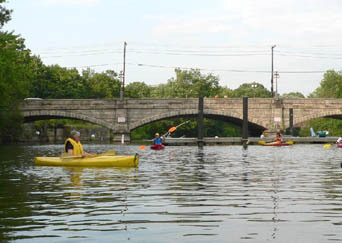 June 18th Blackstone River and Canal paddle in Uxbridge. Meet at 6:00, launching Promptly at 6:15 pm. Leaders are Erik Eckilson eckilson@cox.net 401-765-1741 for the river section and Jim Crowley crowbird888@msn.com for the milder canal section. There is a trip option suitable for all. Paddle on the canal to historic Goat Hill lock or more experienced paddlers can paddle the loop, down the river and then up the canal." Directions - From Rt. 146 North or South: Take the exit for Rt. 16 East. Follow Rt. 16 East for about three miles into downtown Uxbridge. At light turn right and immediate left, to continue on Rt. 16 East. After light, continue to second left. Turn left onto Oak Street. Proceed north on Oak Street for about 1.5 miles, staying right at fork by school. River Bend Farm is on the right. The parking lot is next to the red barn. This trip provides a nice paddle through a flatwater section of upper Slatersville Reservoir and then a stretch of the Branch River. Directions from North: From 146 South, take the Slatersville exit. Take a right off the ramp onto Great Road/Victory Highway. Travel approximately 1.5 miles. Go straight through the light, continuing on Victory Highway (Route 102), and travel another mile. You'll see a DEM sign for the Slatersville Boat Launch on left-hand side. Park in the dirt lot on the left (adjacent to the Slatersville Fishing Club Parking Lot). If you get to the Burrillville town line you have gone too far. Directions from South: From 146 North, take the Slatersville Exit. Make a left off the ramp onto School Street. Travel 1.25 miles and merge (left) onto Greene Street. Travel straight on Greene St. (which becomes Main St.) for another 1.25 miles. Take a left onto Victory Highway (Route 102). Less than ¸ mile on left is a DEM Sign for Slatersville Boat Launch. Park in the dirt parking area on the left- hand side. If you get to the Burrillville town line you have gone too far. July 9th Blackstone Gorge Meet at 6:00, launching Promptly at 6:15 pm. Blackstone Gorge to Millville lock, Blackstone MA Suitable for all levels of experience. Blackstone Gorge to the Millville Rapids from Erik Eckilson on Vimeo. Route 146 South: Take the Forrestdale/ Slatersville exit. At the top of the ramp turn left, then right at light onto Rt. 146A. At next intersection with traffic light turn left onto St. Paul Street. Follow St. Paul street until end at light at Route 122 (Main Street) in Blackstone Mass. Take left at light. Follow Rt. 122 North for about 1 mile. You will see brown and white sign directing you to turn left onto County Street towards Blackstone Gorge. Gorge is at end of County Street, parking lot on left. Take Route 146 North to the Slatersville/Forestdale exit. Take a right at the top of the exit ramp, then right at light onto Rt. 146A. At next intersection with traffic light turn left onto St. Paul Street. Follow St. Paul street until end at light at Route 122 (Main Street) in Blackstone Mass. Take left at light. Follow Rt. 122 North for about 1 mile. You will see brown and white sign directing you to turn left onto County Street towards Blackstone Gorge. Gorge is at end of County Street, parking lot on left. A very scenic paddle for paddlers of all abilities. Enjoy the scenic marsh and a paddle up the Blackstone to the Pratt Dam. Take Route 146 South onto Rhode Island. Take 295 North to Route 114 South (Exit 11). Take Route 114 south, this road is also called High street. Take High Street all the way to the end. Turn right on Mill street and drive down to Broad street. Town Hall Cumberland will be on your right. Turn left onto Broad Street and cross bridge into Central Falls. Take first right onto Maderia Street. Docks immediately on right. Take Route 146 North to Route 116. Take 116 North over the Ashton Viaduct to Mendon Road which is also Route 122. Turn right and head south along 122. When you see stop and shop on your right, turn left at the next traffic light onto Ann and Hope Way. Drive up the hill over the P&W tracks and past Ann and Hope. Turn right onto Broad Street. Take Broad street south and watch for the Cumberland town hall on your left (a Big Brick Building with yellow capped tower) - cross bridge into Central Falls. Take first right onto Maderia Ave. Docks immediately on right. July 23rd Bowdish Lake Meet at 6:00, launching Promptly at 6:15 pm. There is a beach for a quick swim if it is a hot evening. Trip is suitable for all. Please tell the attendent at the booth when you drive in, that you are using the boat ramp. There will not be a charge for using the state ram. From Worcester - Take Rt. 290 South until it becomes Rt. 395 South. Continue to Exit 97 in Putnam Connecticut for Rt. 44 East. Follow Rt. 44 East for appox 7. 5 miles to G the George Washington Camping area on your right. ( you will not be charged a day use fee). Go into the campground and follow the one way signs for approx 1/4 mile. From Rt. 146 South - Take Slatersville Exit. Turn right onto Rt. 146 A. At light by Slatersville Plaza, go straight on Rt. 102 South. Follow Rt. 102 South for seven miles to intersection with Rt. 44 in Chepachet. Turn right onto Rt. 44 West and continue about four miles to the George Washington Camping area on your right (you will not be charged a day use fee). Go into the campground and follow the one way signs for approx 1/4 mile. From Rt. 146 North - Take Slatersville Exit. Turn left off ramp onto School Street. At intersection by Slatersville Common and Church, veer left onto Green Street. Continue through Slatersville to first light at Rt. 102. Turn left onto Rt. 102 South. Follow Rt. 102 South for six miles to intersection with Rt. 44 in Chepachet. Turn right onto Rt. 44 West and continue about four miles to the George Washington Camping area on your right. ( you will not be charged a day use fee). Go into the campground and follow the one way signs for approx 1/4 mile. From Rt. 295 - Take 295 North or South to exit 7B Greenville, Route 44 west. Follow Rt. 44 West for approx. 13.5 miles to the George Washington Camping area on your right. ( you will not be charged a day use fee). Go into the campground and follow the one way signs for approx 1/4 mile. 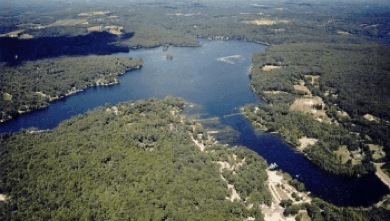 Access to the Providence River and the Seekonk River. Kayak skirts are recommended for the crossing. Leaving the put-in you will head northwest towards the hurricane barrier. On the left you will pass century old pier pilings (caution, some may be just below the surface). Entering the open water below the hurricane barrier there may be some chop, especially with a south wind. Tidal currents are generally not a problem. There can be swells coming up the bay in the open area. Kayak skirts are recommended for the crossing. Rounding the corner, passing tugboats on your right, you pass through the barrier and enter the quiet Providence River. The electric company will be on your left and great views of the city ahead. After passing under the first bridge you are in and under the city. Waterfire braziers line the center of the river. The Providence court house and RI School of Design (RISD) are on your right. Passing under more bridges you come to the confluence of the Woonasqatucket and Moshassuck Rivers. Bearing to the left you come into Water Place Park. The Providence Mall is in front of you. 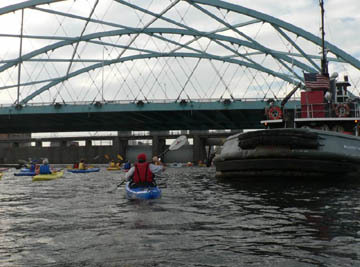 Paddle under the mall and the train tracks and continue up river until you run out of water. It is best to do this section at higher tides. Directions:Take 195 east to exit 5, Warren Avenue. Turn right at bottom of ramp onto Warren Avenue and follow to end (1/8 mile). Turn left onto Waterfront Drive and follow to the end. Bold Pont is right in front of you. Trip is suitable for all and a great place to swim. There may be motorboat traffic. EMS Schools and the Blackstone Valley Paddle Club will be holding a stand-up paddleboard demo session at the EMS Outdoor School on Late Pearl. This session is free and open to all RICKA and BVPC members, but you must register in advance. Contact Erik Eckilson eckilson@cox.net to register. Directions to Sweatt Beach on Lake Pearl - Route 495 Take exit 16 for King Street toward Franklin, Turn onto King Street north toward Franklin, Slight right onto MA-140 S/E Central St., turn right on to Elysium St, and a slight right on to Woolford RD. Sweatt Beach is on your left. You may bring your kayak if you wish to paddle on your own instead of taking the class. Lake Pearl is quiet picturesque pond located mid way between Boston and Providence. Its one of Wrenthams three sizable lakes, rich with conservation lands and open spaces. Funded by the Sweatt Foundation and maintained by many local organizations like the Local Scout Group, Sweatt beach has that small town lakefront beach charm that is enjoyed by many of the surrounding towns. The beach provides a perfect location to paddle and enjoy the picturesque beauty of the shore line. Check the message board for changes and cancellations to trips - flatwater message board. Leaders and hosts for the evening are Steve and Julie. Paddle around Spring Lake and then stop by Steve and Julie's (julierie@verizon.net ) waterfront home for pizza, snacks and beverages on the deck! If you wish to bring a dish or snack we will have someone there to drive it over while we paddle. Bring a headlamp or waterproof light for the paddle back. Trip is suitable for all and all are welcome! line of the lake through a small lake front neighborhood. State boat launch will be on right at the bend in the road. Joslin Road. Take first left onto Spring Lake Road. Proceed about 1/2 mile and take left onto Black Hut Road - there is a sign to the beach here. Go past Spring Lake beach parking lot and follow Black Hut along the shore line of the lake through a small lake front neighborhood. State boat launch will be on right at the bend in the road. left on to access road. At end of road, turn right onto Victory Highway and first right onto Joslin Road. Take first left onto Spring Lake Road. Proceed about 1/2 mile and take left onto Black Hut Road - there is a sign to the beach here. Go past Spring Lake beach parking lot and follow Black Hut along the shore line of the lake through a small lake front neighborhood. State boat launch will be on right at the bend in the road. September 7th GO Program for the Corridor- No membership required. Blackstone Gorge. Meet at 12:30 for a 1:00pm laucnh. Thank you this is end of the 2019 season. Join us next year when we start our 20th year!